25 Comments on "Healthier Apple Crisp"
Thank you for making the recipes so easy to read & print with a picture. 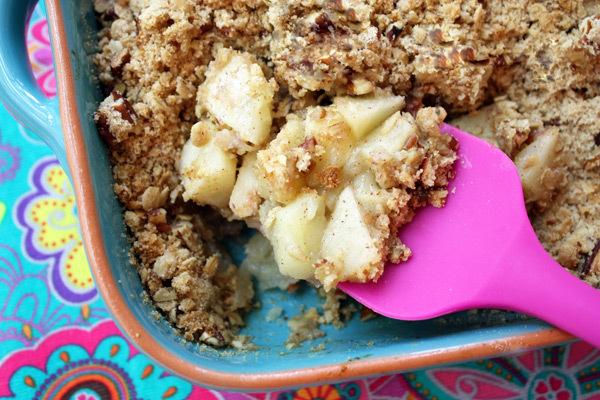 The ingredients for this apple crisp make me want to make it today. Love the low sugar recipes. Does anyone not like apple crisp? You’ve done it again Jenny!! I love your healthier recipes and a big fan of apple crisp so I had to make this today. I used 6 small/medium Granny Smith apples and it turned out fabulous topped with fat free whipped cream. Keep those recipes coming. This apple crisp is delicious. I did have to bake longer than 35 min in order for the apple slices to be soft e ough. My wife made this desert but used a jar of cherries from Trader Joes, something she always has on hand, and it was delicious. She calls it her emergency desert, easy to do on short notices because it contains products that can be kept on hand. Thanks very much and we look forward to your next one. I really enjoy your recipes, love watching you cook them. I’m going to try this one soon enough. Hi Jenny thank you so much for the new recipe ,looks delicious 😋 I can’t wait to try it ,you do such a great job keep bringing them!!! you’re the best. It’s ALWAYS good to see you out of hibernation! Looks like a tasty recipe that I can try in my Dutch Oven. Don’t stay away too long, Jenny. We miss your bubbly personality and all the color coordinated kitchen dodads! Blessings! Shallow pans are generally recommended for crisp recipes so I’m not sure a Dutch oven would be as good. Please report back if you try. One large granny smith apple usually weighs 1/2 pound so 4 really big ones are enough. Miss Jenny: Are you ever going back on U TUBE? I miss you and your recipes videos. Apple crisp sounds and looks delicious, I will definitely try it and love it as I do all your recipes. Of course as many others will agree, I want to actually WATCH you make it. Jenny come back to us in your videos! Miss you, miss you, miss you. Love apple crisp. The butter from Ireland KERRYGOLD is supposed to be heart healthy, why not use that? The taste can’t be beaten. Or use half butter and half light olive oil. Thank you for the recipe. You have been heavy on my mind lately, how are you doing? I miss being able to communicate with you but know that this crazy lady has been thinking about you and hoping you can feel the vibes. Looks delicious! I can’t wait to make it! Yea! Another recipe from Jenny! I’ve just added Granny Smith apples to my shopping list and will make your healthy apple crisp this weekend. Can’t thank you enough for your recipes Jenny. Thank you Jenny, for providing such great, healthy, recipes. I have prepared many of your recipes and watched most of your videos. So helpful and informative! I hope you will be making more videos in the future. Thank you, again! I feel I can trust your instruction, and my family has been quite happy with the results. Hi Jenny, love your recipes, you make cooking so much easier I truly enjoy making them. thankyou for all your hard work. This sounds delicious , especially the topping. I too miss seeing you in your videos, I wish you would please start making them again. You always gave me a happy feeling with your humor plus I love your cooking. I agree! Love all your recipes and they’re so easy. I miss your hilarious sense of humor in your videos! Made your sprouted whole wheat bread last night and is delicious! Can’t wait to try this recipe! Have made several of your other recipes as well. Sure do miss your videos though. Wish you would make more! They really make my day.